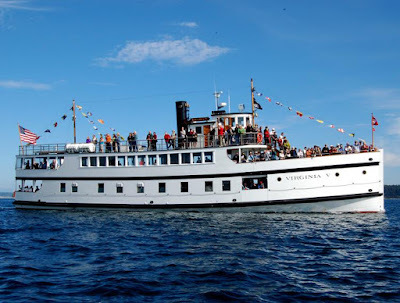 Thanks to support from 4Culture, two cruises aboard the Virginis V were offered to the public. 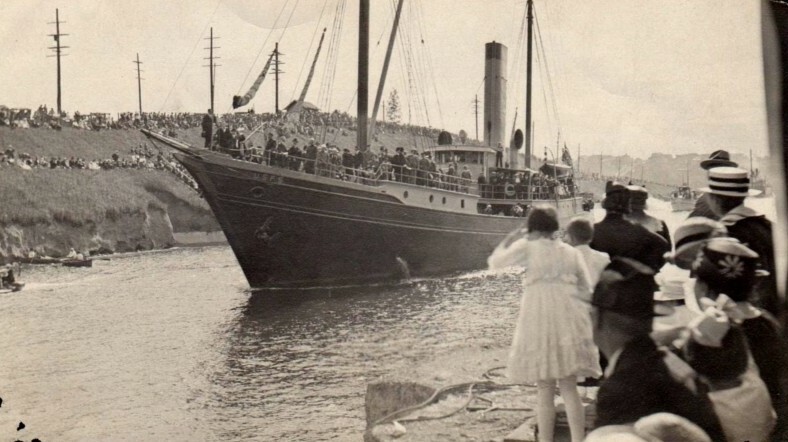 As the year 2017 will mark the Centennial of the formal opening of the Lake Washington Ship Canal and the Chittenden Locks, it is hoped that more of these cruises will be made possible and it will provide an opportunity to participate in events organized to celebrate the anniversary. 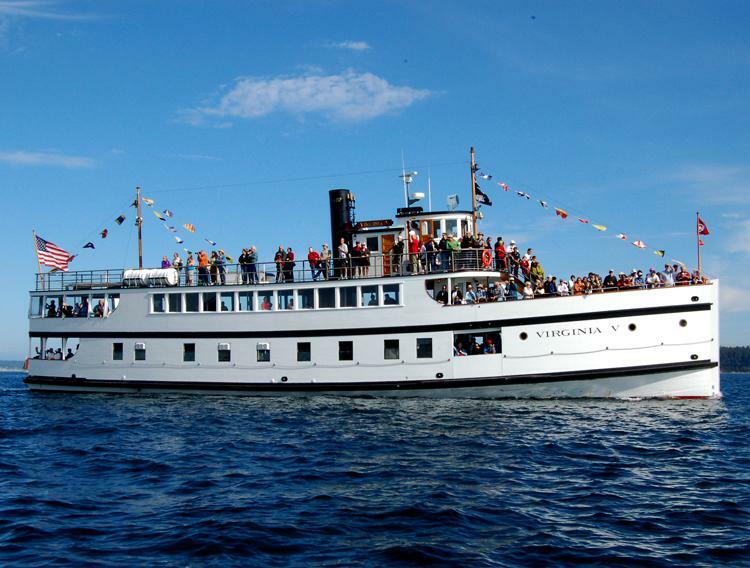 Virginia V a 1922 National Historic Landmark vessel. 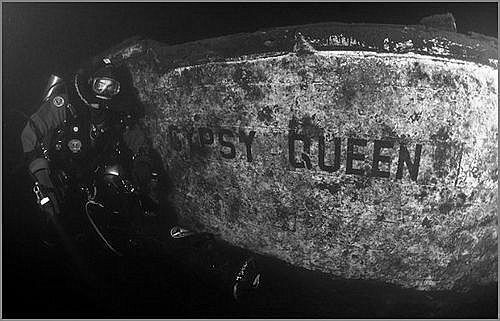 Originally a mine sweeper, the Gypsy Queen lies on the bottom of the lake. Once the cruise departs we follow a path heading west along the canal and out through the locks and return again. Optimally, it will last a few hours, however, delays are always possible when dealing with hundreds of boats plying the same waters and the locking portion may take additional time depending on boat traffic. 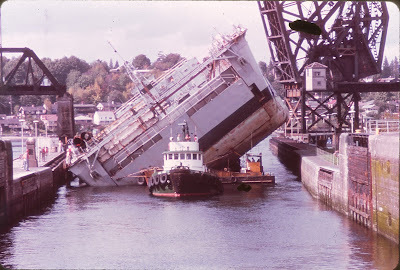 The White Sands coming through the locks in 1975. It was tilted to fit the 81' dock through the 80' wide lock. The White Sands today - untilted. 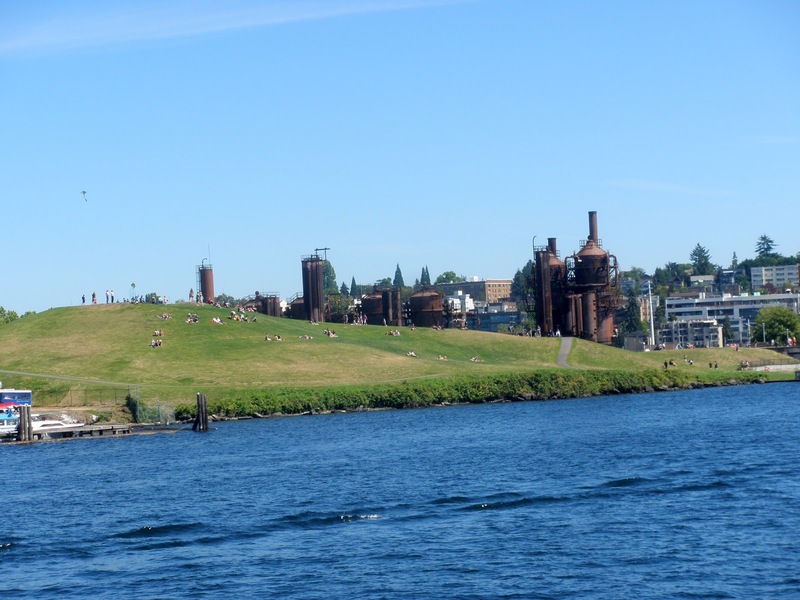 At the top of the lake is one of Seattle top visitor spots, the historic Gas Works Park. From the early 1900's, it was used to supply synthetic gas originally made from treated coal, switching to petroleum in the '30s until it finally closed up shop in 1956. 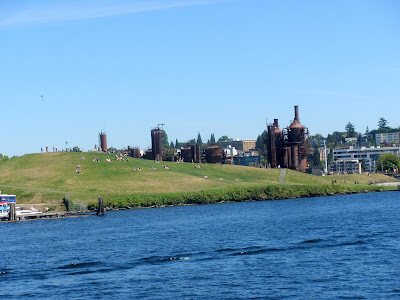 The remnants of the Gas Works plant. 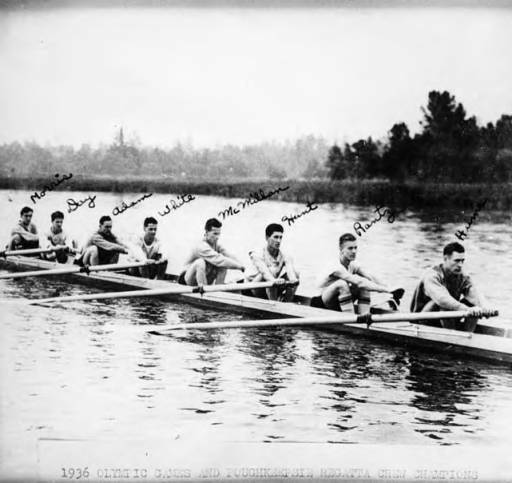 The completion of the canal had an immediate impact on the timber industry of the region. Wood was in high demand all along the west coast as populations were expanding rapidly. 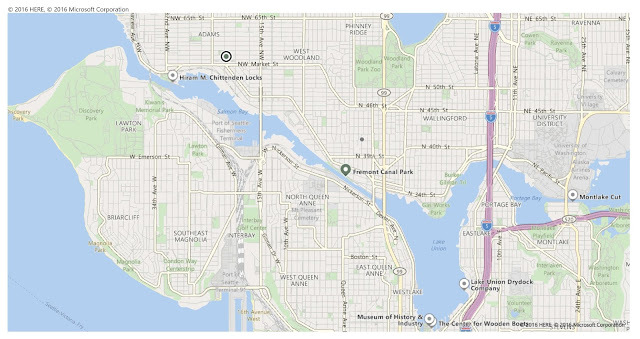 The ability to send large log booms from Lake Union out through the locks and to destinations worldwide led to a immediate productivity increase. Left at Portage Bay pre-canal. Log boom in large lock in 1916. In June 1911, a groundbreaking ceremony was held in Fremont to begin the excavation which would eventually become the Fremont Cut. The speakers platform was at the intersection of Phinney Ave and Ewing St. which would be just south of the Theo Chocolate building. The cruise passes under several of Seattle's bridges. 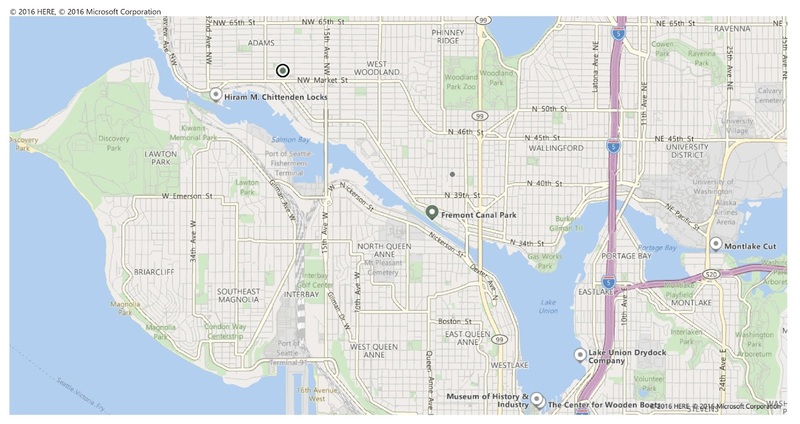 Aurora, Fremont, Ballard and the BNSF railroad bridge are all part of the ship canal's history. 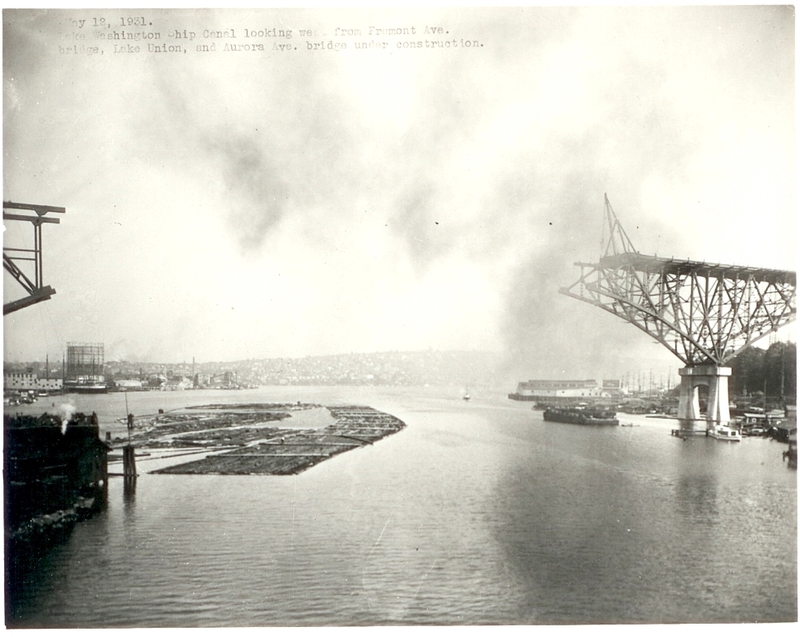 The railroad bridge was actually relocated in 1914 to allow for the construction of the Chittenden Locks, and the Fremont and Ballard Bridges were completed in 1917. The Aurora Bridge did not come into existence until 1932 and we found a picture of it prior to completion. Aurora Bridge under construction in 1931. Local documentarian Vaun Raymond has contributed many mini films concerning the history of the Ship Canal and his latest is on the bridges. There will be more films to come so be sure to visit the site for updates. 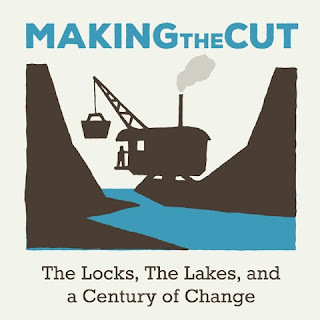 After passing numerous ship yards, marinas, and houseboats, including the famous "Sleepless in Seattle" houseboat, we come upon the Chittenden Locks, originally simply called Government Locks when it was finished in 1917. At the time it was the second largest lock system in the world, after the Panama Canal, which was finally completed by the Army Corps of Engineers in 1914. The Lake Washington Ship Canal, long a dream of many, was finally completed, opening unparelleled opportunity and growth to the fledgling city. 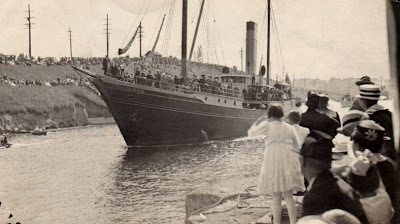 At the same time, it must be acknowledged that the construction of the canal caused severe upheaval and removal of many local businesses and individuals, and drastically changed the world of the native inhabitants who lost homes, fishing grounds and burial sites to this project. A view of Rainier after leaving the locks. Making the Cut is a group of local organizations who are organizing events celebrating the 100th Anniversary of the Lake Washington Ship Canal. Explore their web site for historic maps, links to videos, schedules of upcoming events and much more as the Centennial approaches.